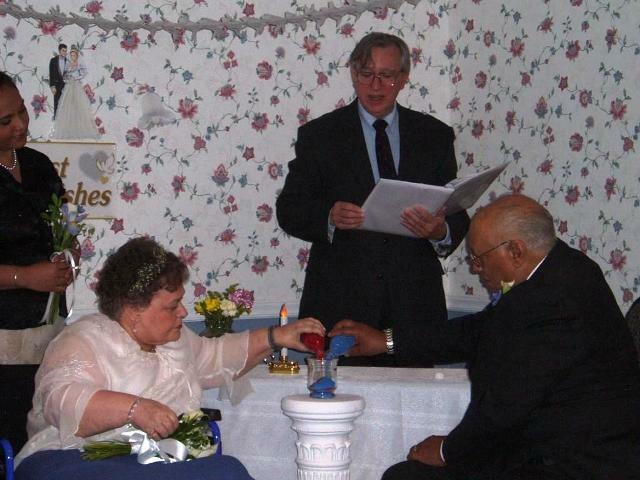 You might think "Sand Ceremony!" if you're going to have a beach wedding, but have you considered it for other locations? A sand ceremony is a suitable replacement for a unity candle if your wedding is going to be outdoors, where there is the chance that the candle flames might be blown out by wind, or indoors where open flames are not permitted. Each of you begins with a bottle of sand that represents yourself as an individual. There is a larger, empty container that represents your future life together. As you pour your grains of sand into the big container, we watch them intermingle, symbolizing the joining of your lives. Sand is used because it has very small grains, making it nearly impossible to separate the two original sources from each other. The symbolism is that the two of you will be as inseparable in your marriage as the grains of sand. "Where Does the Sand Come From?" Some couples prefer to use natural beach sand that they have collected from places meaningful to them. Did you enjoy a trip to Cape Cod, and scoop up sand there? Did you bring some black sand from Hawaii? Or some red sand from Greece? If the colors of the two sands are very different, the blending is more visually striking. 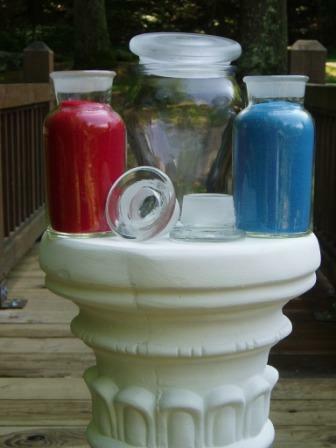 Some couples favor using specially-colored craft sand, such as red and blue which combine harmoniously to make purple. Your theme colors could be echoed in your sand colors, or could complement them. Or the color of the combined sands could match one of your theme colors. Usually glass bottles are used because seeing the individual colors, and then the combined color, is important. Some couples use clear plastic bottles to avoid any possibility of breakage. No matter what kind of container you choose for your combined sand, a cap or lid is strongly suggested. You could decorate your sand bottles with ribbons of your theme colors, and perhaps interlocking hearts on the jar for the combined sand. How about a pair of lovebirds on the jar lid? Your imagination is the only limit! Children often feel the need to be included, especially the child or children of a parent taking a new partner. Having a child participate by pouring sand into the big bottle is easy, safe, and is a wonderful opportunity for photographs that will be treasured for years. ("See? I was there and I helped!") What better symbol of a blended family than a Sand Ceremony with children? Some couples have their parents participate in their sand ceremonies by having them pour a foundation in the bottom of the big sand bottle. It symbolizes the love and support that your parents give you which will help you sustain your own marriage. Your parents, friends, or relatives could bring your sand containers to you. This might be especially helpful in a location where it would not be convenient to have a table set up. If the number of people attending your wedding is small, you may want to consider having each person put a scoop of sand into your big bottle. Each person could offer their good wishes, either silently or aloud, as they poured their scoop. You would add your sands last, building on the foundation that your loving friends had made for you.